This recipe for easy smoked ham starts with a pre-cooked ham, which after a few hours becomes something much different...and much better. Some smoke, a few spices, a flavorful basting liquid, and a brown sugar glaze come together to turn an everyday ham into a work of art. Rinse the ham and trim off any loose flaps of fat or skin. Combine the dry spices (don't use the brown sugar here) and season the entire surface of the ham. 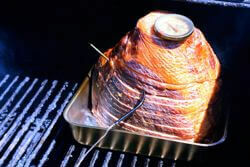 Place the ham in a smoker and keep the temperature between 200F - 225F. 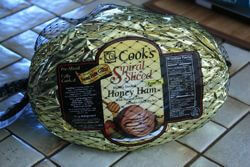 Smoke the ham with hickory, pecan or oak for 4 to 6 hours. Since the ham is a ready-to-eat ham, it just needs to be warmed before eating. An internal temperature of 140F is a perfect serving temperature. Combine the orange juice and the pineapple juice, and use it to baste the ham every half-hour or so as it smokes. Combine a little of the juice mixture with the brown sugar and coat the top of the ham with it an hour before removing it from the smoker. Place the ham in a shallow pan in the smoker if you're concerned about getting the juice and brown sugar inside the smoker. This ham recipe is a great way to spice up an everyday ham. Instead of using a true ham from the back leg of the porker, you can use a picnic ham with equally good results.